…and no need to sell your mama, papa, pikin, sister, brother, leg, arm…gbo gbo e…you get my drift 😮. 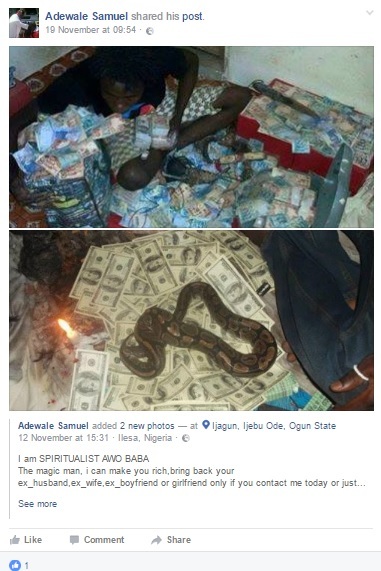 Adewale Samuel calls himself the magic man who can make you rich bring or back your exes through some kind holy ghost fire means. He is advertising his service on facebook with scary images of pythons and co.
Is this for real? Do these still really exist? If it really is, you cannot stop a man from doing what he gotta do, I just hope no human lives have been truly involved.